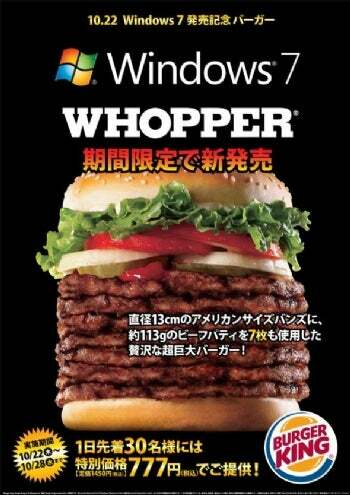 Microsoft's Windows 7 'Whopper' Campaign: The Worst Promotion Ever? Smooth Windows 7 Launch? Look Closer. Windows 7 hits today, and we'll be posting something on what that means for PC gamers later on - but in the meantime feast your eyes on this monstrous promotional campaign that Microsoft is running in Japan. For the next seven days, Burger King will be a selling a gigantic seven-layer Whopper, which is apparently a gargantuan five-inches thick. The price? Y777, of course -- at least for the first 30 customers each day. If you're customer number 31, you'll be paying Y1450. Given that a double Whopper is loaded with just shy of 1,000 calories, we're guessing that this one's a good few days worth of "nutrition." This story, "Windows 7: A Whopper of an OS, with a Side of Fries" was originally published by GamePro.